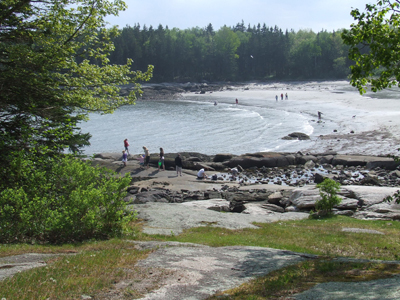 A grant from the Land for Maine’s Future program allowed the Maine Department of Conservation to acquire land needed to complete public ownership of the beach, protecting the site’s natural character by buffering it from development. 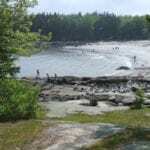 Known for its gentle surf and brisk waters, the attractive crescent-shaped beach at Birch State Point Park (known locally as Lucia Beach) is a favorite among area residents. Massive rocks that frame the beach offer good perches for picnics, reading, or simply gazing out at the beautiful islands of the Muscle Ridge Channel. DeLorme Maine Atlas and Gazetteer Map 8 A-3. From Rockland, take Route 73 south, turning left onto North Shore Drive once over the Owls Head line. Take your first right onto Ash Point Drive and turn right again just after the Knox County Regional Airport, following that road down to the park.